Who wants plain cinnamon rolls when you can have Cereal Milk Cinnamon Rolls, aka the sweet rolls I wish I knew in my youth could exist? 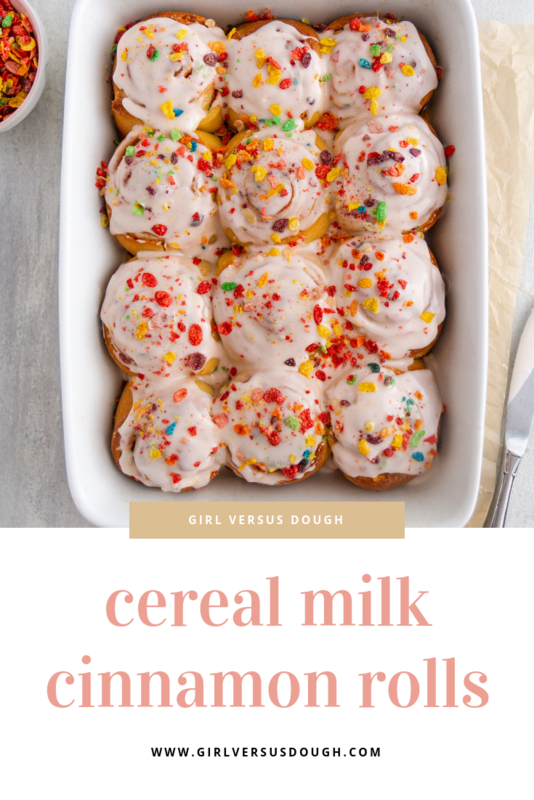 Fruity cereal milk combines with soft sweet dough that is baked and topped with a cereal milk-infused glaze and, of course, more cereal. 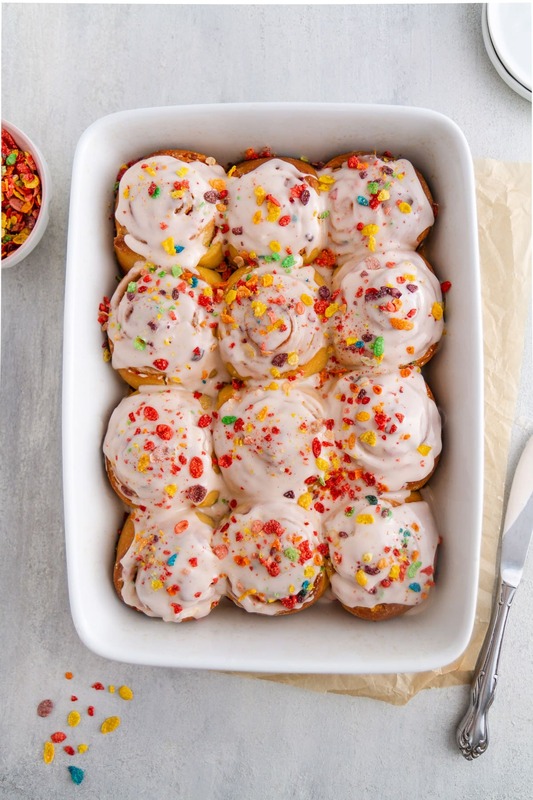 These bright and happy rolls are perfect for a special weekend breakfast. Hello, hello! If you’ve got a keen eye, you may notice that things are looking freshy-fresh around here. That’s right — good ol’ GVD got a face-lift! It’s been a long (like, loooooong) time coming, but I hope you love it as much as I do. It feels very much like home again. I also feel like these Cereal Milk Cinnamon Rolls are the perfect recipe with which to celebrate. They’re fun and fruity and full of sweet flavor, and I can imagine them as the centerpiece for anything from Easter brunch to a birthday breakfast (or, you know, for when a blog gets a new design, things like that). 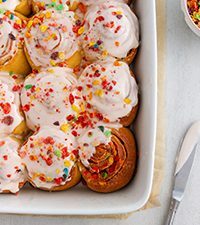 If you’re a fan of cereal milk and/or cinnamon rolls (HI, IT ME), you are going to love these rolls. 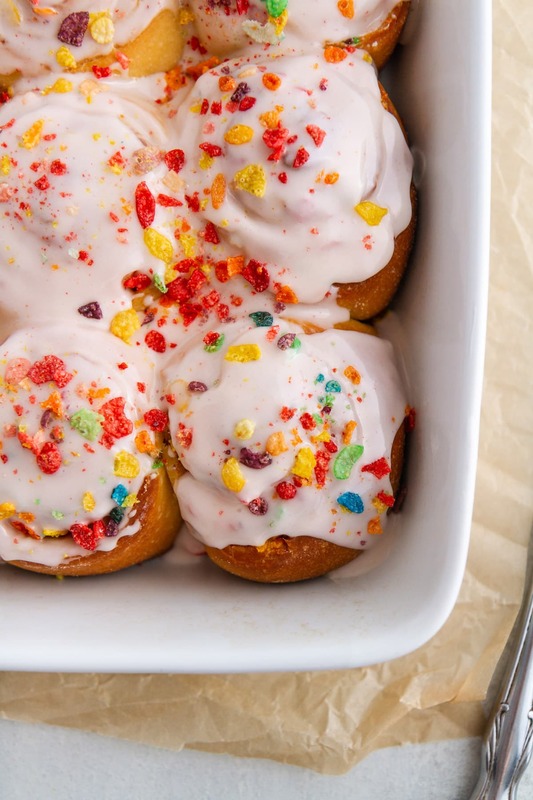 They taste exactly like a cinnamon roll that’s been infused with fruity cereal and, to be honest, I wonder where this combination has been all my life. Because it is so, so good. We start with my go-to cinnamon roll dough (which made its first appearance in my Overnight Cinnamon Rolls), stir some cereal-infused milk (that’s pink!) into the dough, fill it with butter and cinnamon and more cereal (naturally), roll it up and let it rest overnight. 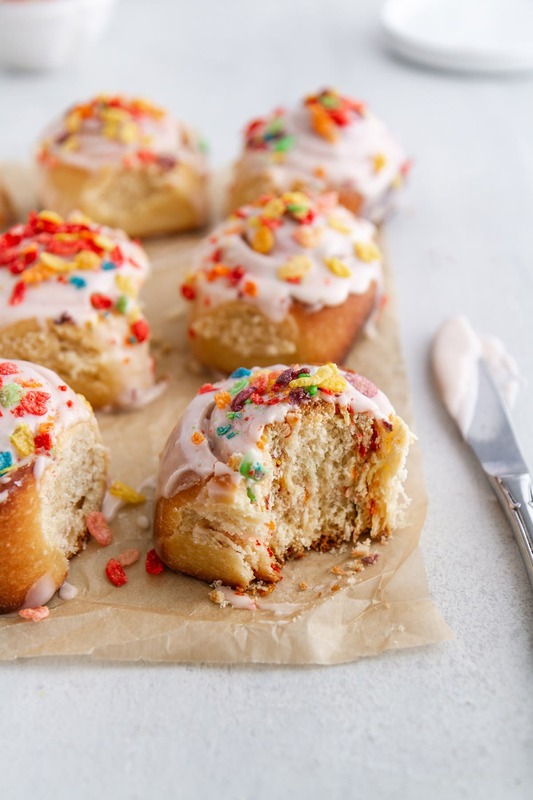 The next morning, we bake the rolls, then top them with a cereal milk-flavored glaze and — you guessed it — more cereal. Every warm bite is soft and sweet with a fruity crunch and I just cannot handle how much I love it. You may have noticed. 1. Some say this is negotiable, but I’ve found cinnamon rolls to bake up best when I start with room temperature eggs. Though the cereal milk gets added in at a slightly cold temperature, the eggs will still incorporate better if they’re not straight from the fridge. 2. Don’t skip the steaming step! This might seem fussy, but it’s really important to allow the rolls to puff and warm up after their long nap in the fridge. 3. Can’t have cinnamon rolls without a cream cheese glaze? Swap the more icing-like glaze in this recipe for the cream cheese version in this recipe. Still top it with fruity cereal, obviously. Friends, if all Wednesdays involved Cereal Milk Cinnamon Rolls, never again would we experience the midweek slump. So, let’s make this a regular thing? You know I’m in. 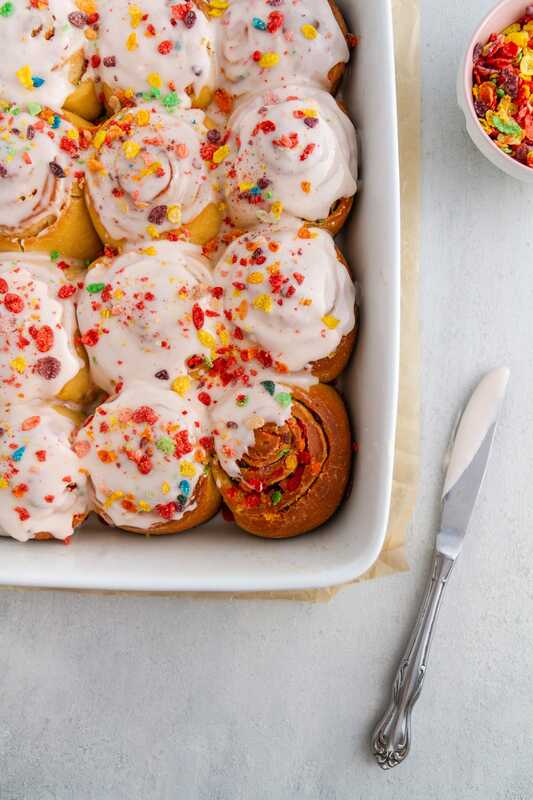 Fruity cereal milk-infused overnight cinnamon rolls with a sweet cereal milk icing. First, make the cereal milk: In a small bowl or cup, stir crushed cereal and milk until well combined. Let sit 20 minutes, stirring occasionally. Strain mixture through a fine mesh strainer into a separate bowl or cup. Set off to side. In a large bowl or in the bowl of a stand mixer with the whisk attachment, whisk egg yolks, whole egg, sugar, 6 tablespoons butter and 3/4 cup cereal milk. Add 2 cups flour along with yeast and salt; whisk until just combined. Replace whisk attachment with dough hook and add 3/4 cup flour. Knead on low speed 5 minutes (alternatively, knead dough on a floured surface for 10 minutes). Add more flour as needed until dough is soft but not sticky. Continue to knead in stand mixer 5 minutes (or 5-10 minutes by hand) until dough no longer sticks to the sides of the bowl. Lightly spray a large bowl with cooking spray. Shape dough into a ball and place in bowl; turn once to coat with oil. Cover bowl with plastic wrap and let rise in a warm place 2 to 2 1/2 hours or until doubled. Spray bottom and sides of a 13×9-inch baking pan with cooking spray. Punch down risen dough; turn out onto a lightly floured surface and gently shape into a rectangle, long side facing you. Use a rolling pin to roll dough into an approximately 18×12-inch rectangle. Brush 4 tablespoons melted butter over dough to within 1/2-inch of the top long edge. Sprinkle with cinnamon, then sprinkle with 1 cup crushed cereal. Beginning with long end nearest you, carefully roll dough into a tight log. Firmly pinch seam to seal; turn so seam side is down. Use a serrated knife to gently cut dough into 12 equal-size rolls, about 1 1/2 inches each. Arrange rolls cut side-up in prepared baking pan. Cover tightly with plastic wrap and refrigerate overnight, at least 8 hours up to 16 hours. The next morning, remove rolls from the refrigerator; uncover and place baking pan of rolls in the oven, turned off. Place a shallow pan on a rack just beneath the rolls; add enough boiling water to pan to fill 2/3-full. Immediately close the oven door and let rolls steam 30 minutes until puffy. Remove rolls and shallow pan from oven. Heat oven to 350 degrees F. Return rolls to oven and bake 30 to 35 minutes until deep golden brown. While rolls are still warm, make the glaze: In a medium bowl, whisk powdered sugar, 4 tablespoons cereal milk and vanilla to form a smooth, thick-but-drippy glaze (add more cereal milk or powdered sugar as needed). Spread or drizzle glaze over warm rolls; sprinkle with more crushed cereal. Serve warm. Use any fruity cereal you love! Your new blog looks good. I would love to try this with cinnamon toast crunch. Becky, OMG YES DO THAT. Love the new look and my bad eyes appreciate the large font. ; ) Thanks for the recipe, Happy Wednesday! JoAnn, Oh I’m so glad! 🙂 Thank you! These would make great overnight party breakfast favs!! Love the color and the idea of mixing two breakfast favorites together! !